All of our releases are available at your favorite download services and streaming services such as Spotify, Deezer, Apple Music, iTunes etc. 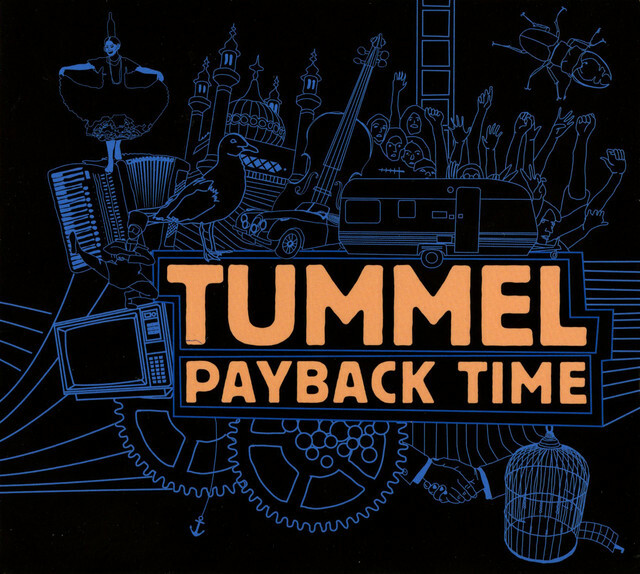 Tummel release album #4 “PAYBACK TIME”! This great album was recorded in I/O studios. With the addition of singer Jens Friis-Hansen, the band takes a definite step closer to “popular” music, adding ingredients from pop, rock, jazz and cabaret music, while still retaining a strong foothold in the music of Eastern Europe. Now available on CD and in download stores! After finishing recording their third album TUMMEL’s clarinetist decides to leave the band! The tubaist strikes his head in his workshop, and due to a serious brain concussion he is forced to take a year off! The drummer manages to break his leg during the recording session, 3 months on crutches. A mysterious fever rages among the rest of the members. Despite bursting livers, TUMMEL succeed to finish the record! And in midst of these sufferings, three children are born, engagements are broken and cars wrecked! Payback Time was recorded by Per Tidstrand / monophon at I/O studios and mixed and mastered by Joakim Barfalk / Chromophone.